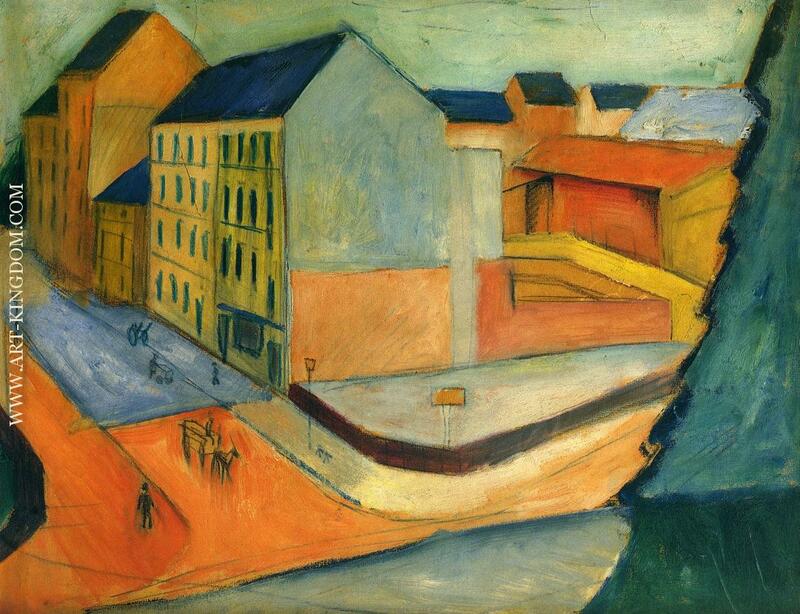 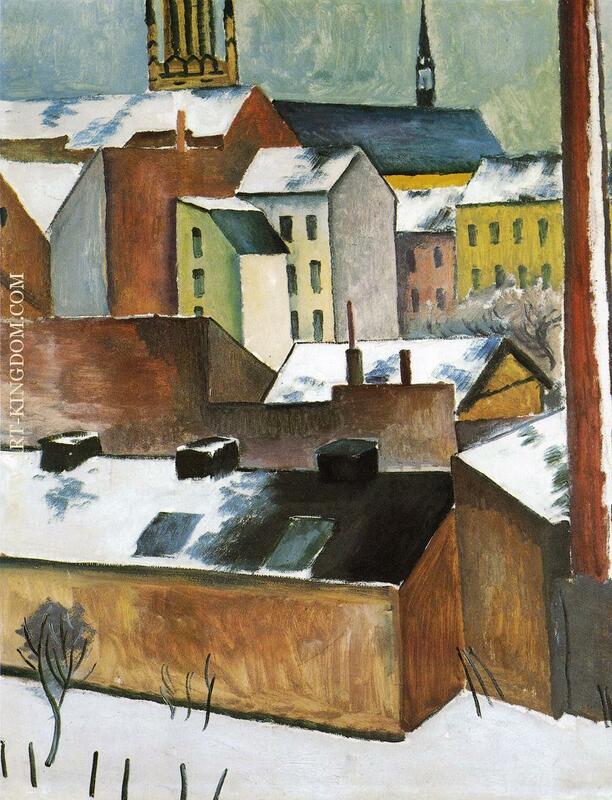 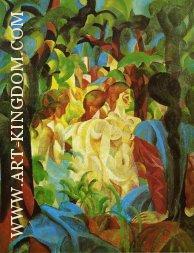 August Macke is born in Meschede in 1887. 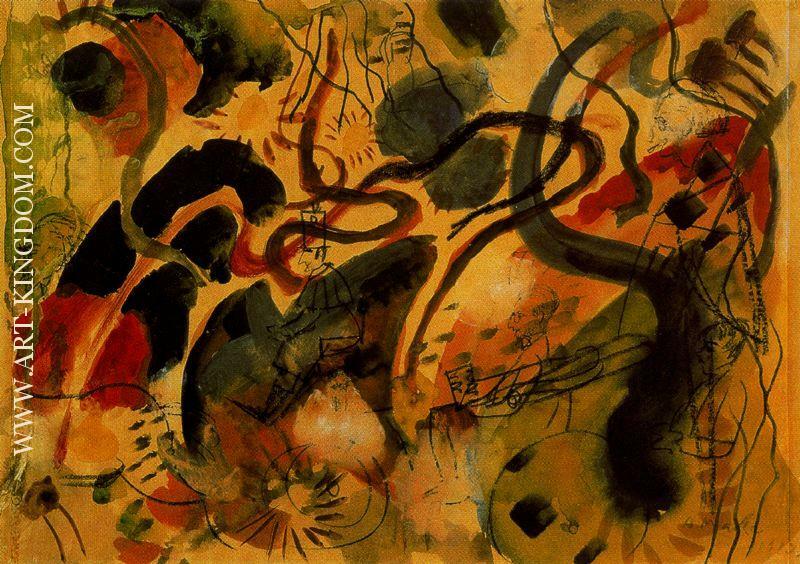 He studies at the Düsseldorf Art Academy and the School of Applied Art from 1904 to 1906, earning a living as a stage designer. He continues his art studies at the painting school of Lovis Corinth in Berlin in 1907-08, traveling to Paris twice during this time. 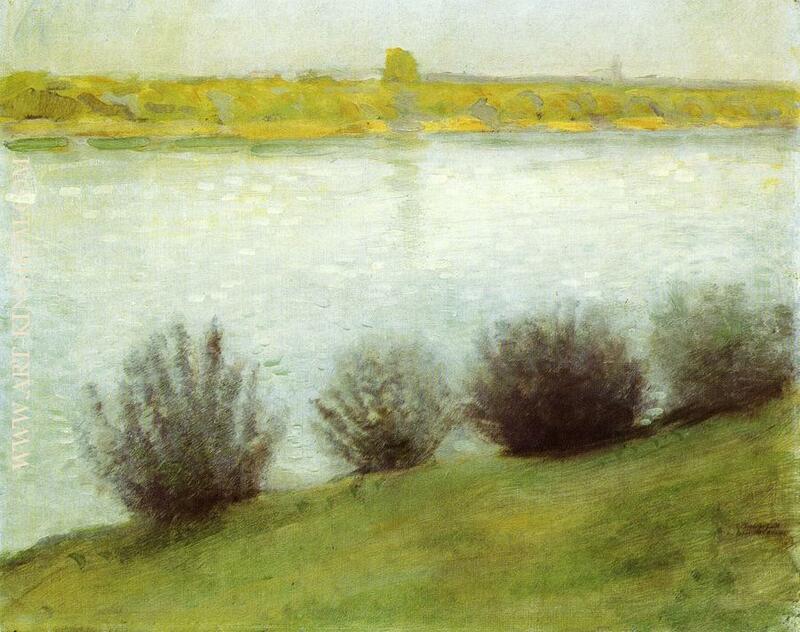 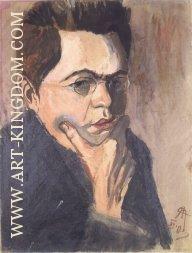 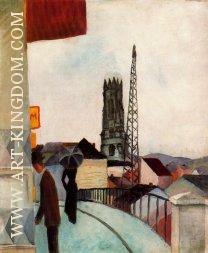 He meets the painter Louis Moilliet while staying in Switzerland for some time in 1909. August Macke spends a lot of time in Munich in 1909-10, moving to the Tegrnsee with his wife Elisabeth. He attends an exhibition with works of Franz Marc in 1910, that fascinates him so much that he decides to visit the artist in the Upper Bavarian town of Sindelsdorf, which marks the beginning of a close friendship, their lively exchange of ideas is documented in numerous letters. 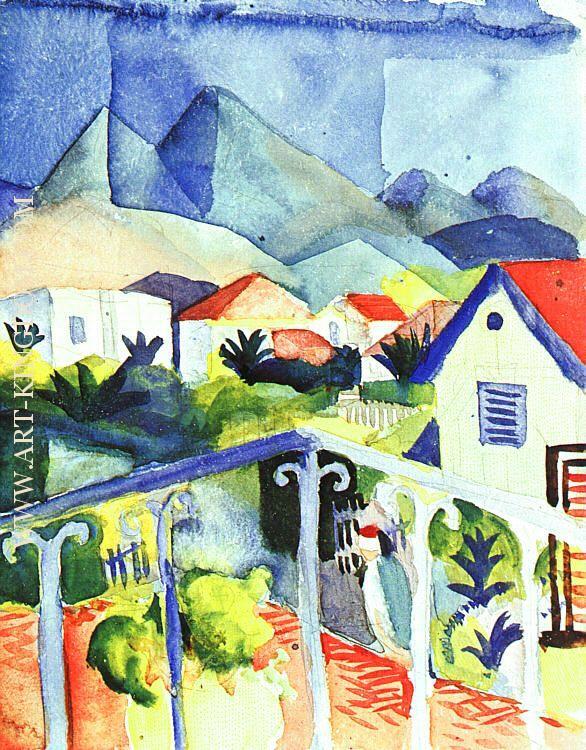 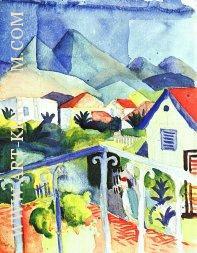 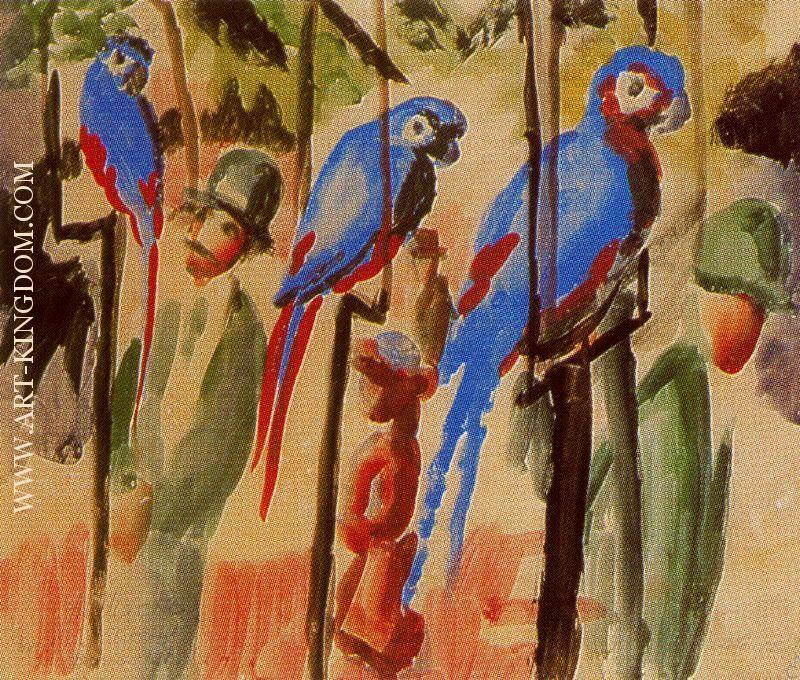 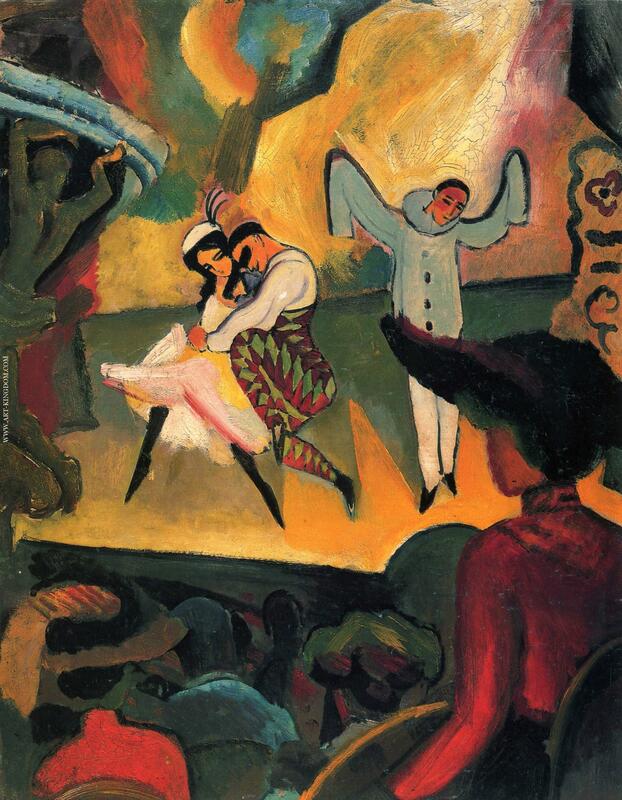 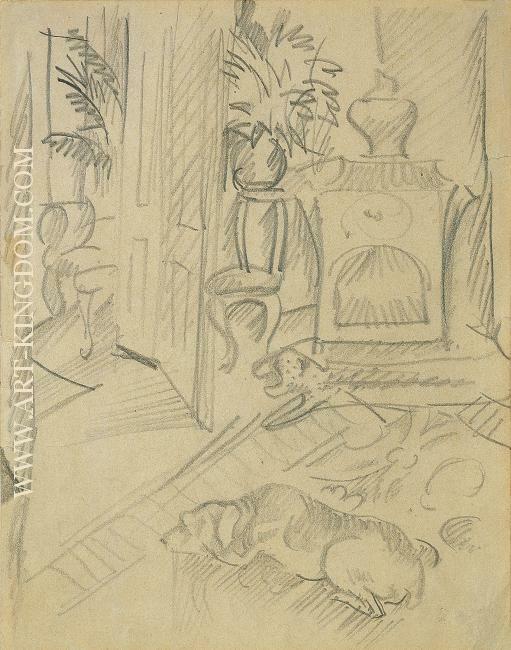 Macke paints a vivid portrait of Macke in 1910. 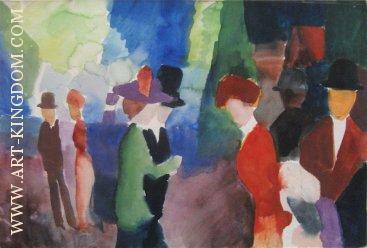 August Macke gets to know Wassily Kandinsky and Alexej von Jawlensky in late 1910 and comes into contact with the "Neuen Künstlervereinigung München" (Munich New Artist's Association). 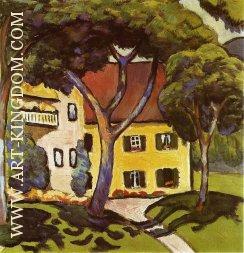 He relocates with his wife to Bonn in 1911, however, staying in touch with the Munich group. 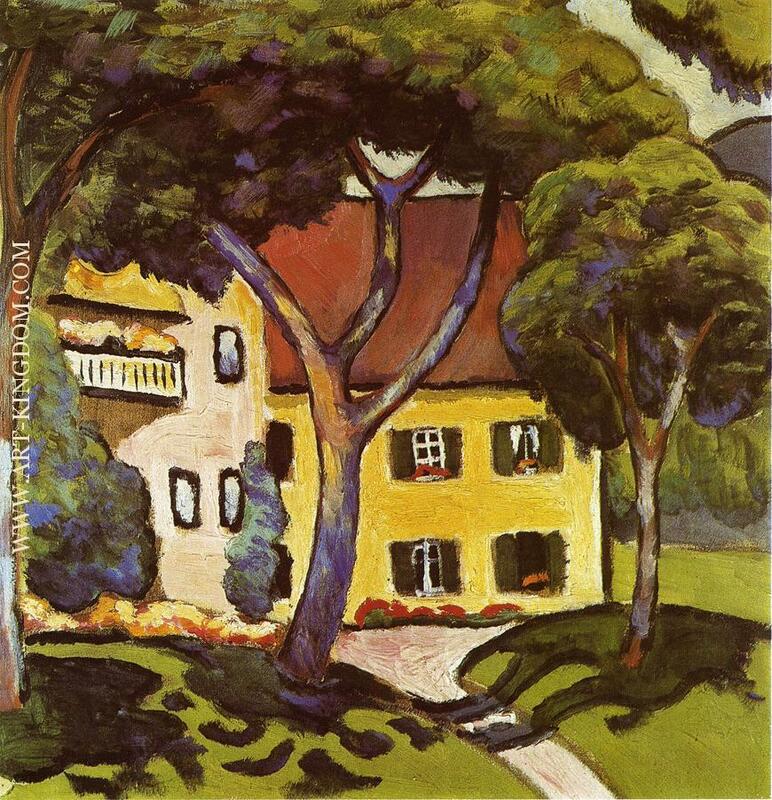 Macke is a member of the artist group "Der Blaue Reiter" (The Blue Rider), as of 1911-12 and shows works at both exhibitions. 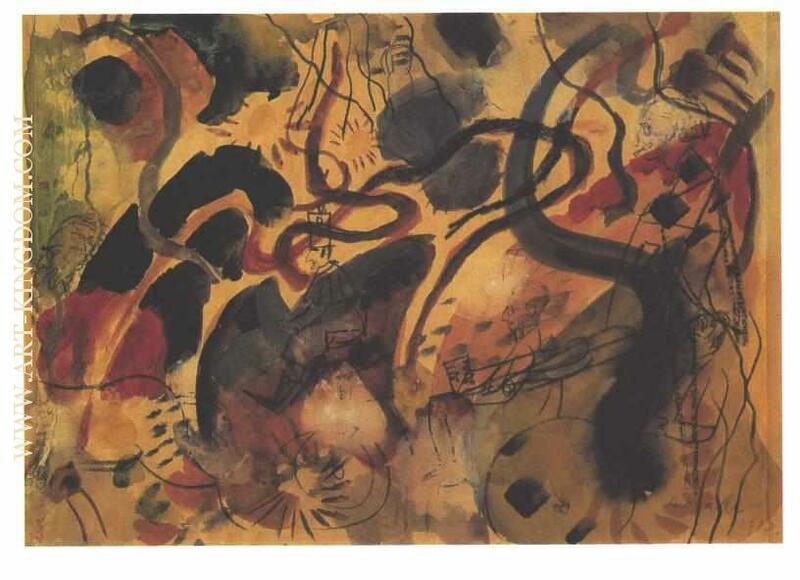 The important "Sonderbund-exhibition" takes place in Cologne in 1912, giving a comprehensive overview of new European trends in art. Macke contributes to this exhibition with both his works and also as one of the organizers. 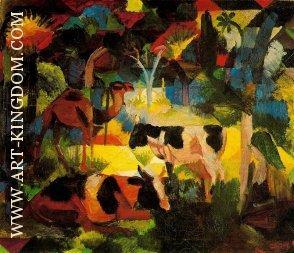 He also goes on his fourth journey to Paris the same year, this time accompanied by his friend Franz Marc. 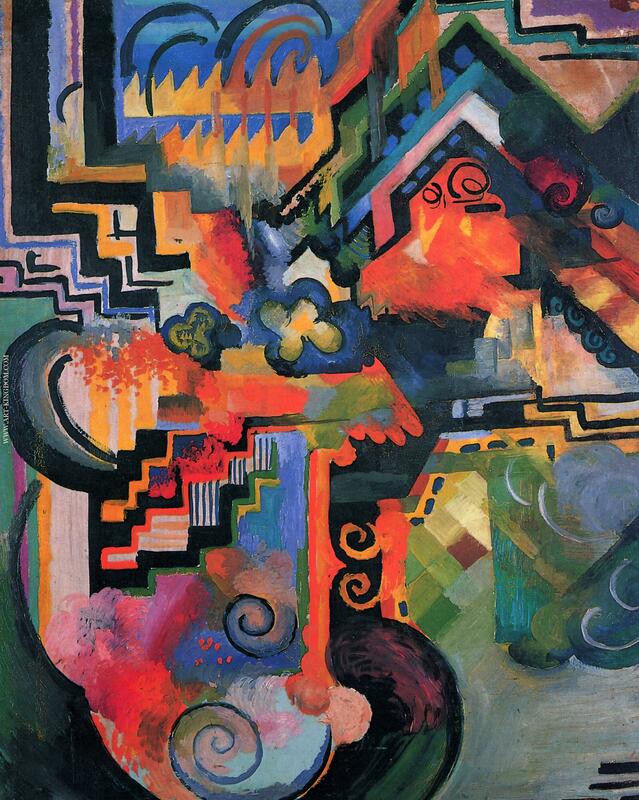 A visit to Robert Delaunay and his orphistic painting leaves a mark with the two artists. 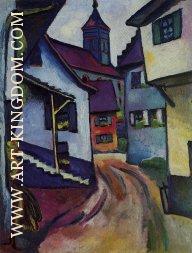 The Macke family moves to the Swiss town of Hilterfingen on Lake Thun in 1913. 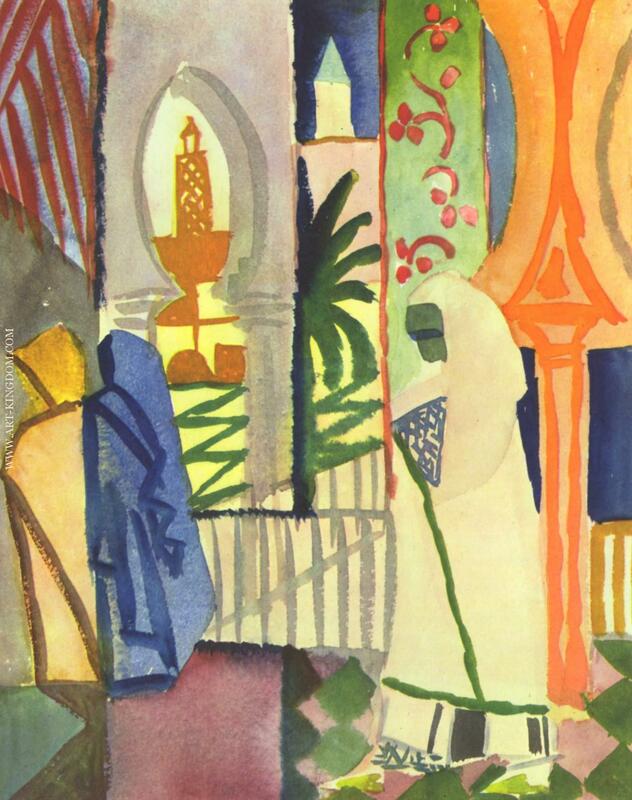 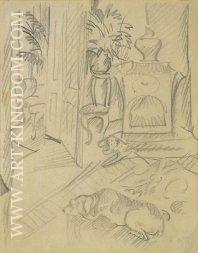 Macke travels to Tunis with Louis Moilliet and Paul Klee in 1914. In the beginning August Macke’s style was geared at Impressionis, however, he picks up elements of futurism and Cubism. 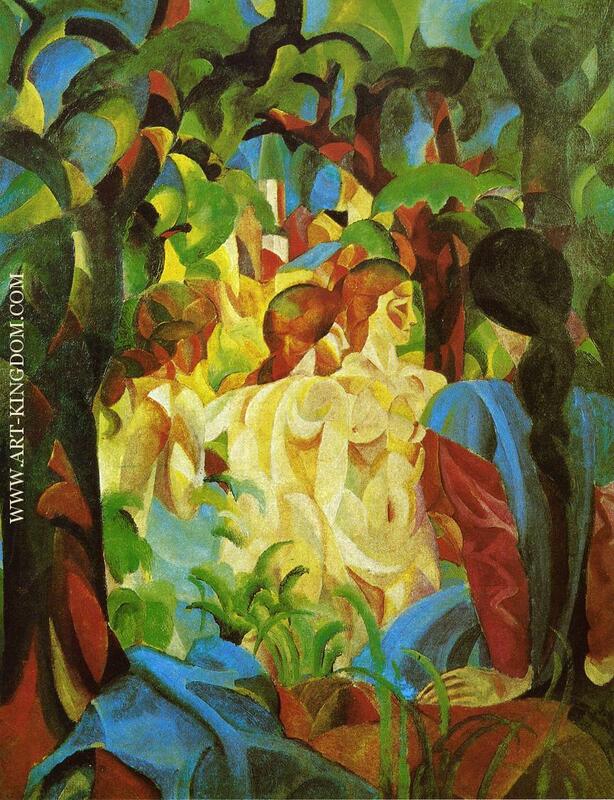 It is probably due to the encounter with Robert Delaunay and his orphistic style that Macke’s pictures undergo a certain clarification and simplification of forms. 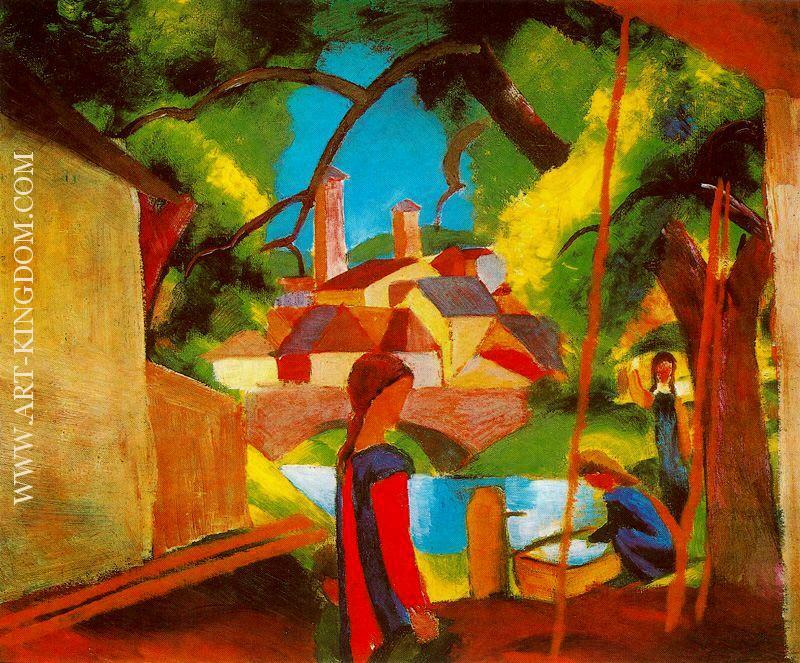 First of all, August Macke is regarded a master colorist, generating a colorful and cheerful world in his paintings and watercolors. 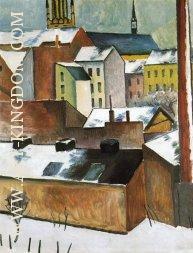 Besides portraits, his oeuvre comprises landscapes, still lifes and nudes with recurring topics. He often depicts walkers under trees, in parks and in zoos, women in front of shop windows, boutiques and hat shops. 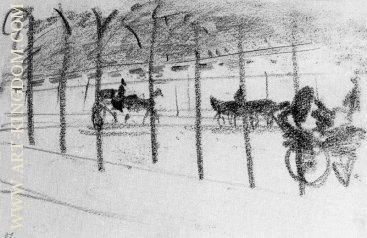 August Macke dies on September 26, 1914 as a soldier near Perthe-les-Hurlus in the Champagne. 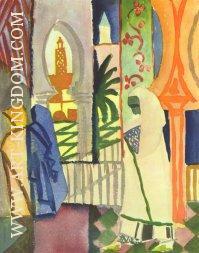 Despite his short life, he leaves a mature and extensive oeuvre of great strength and high quality.